The 3/4" Adjustable Pressure Regulator adjusts between 28 and 60 PSI. Has FPT (Female Pipe Thread) inlet and outlet. To adjust pressure between 28 and 60 PSI, remove the red cap and using a screwdriver adjust the pressure to fit your needs. 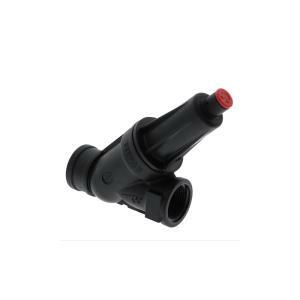 This pressure regulator works well with sprinkler or drip irrigation systems. Periodically remove and clean the pressure regulator. Always install pressure regulators downstream from all shut-off valves. Be sure to install pressure regulators in the proper direction. The arrow on the housing shows the direction of the flow and should always point downstream toward emitters.